There are certain fundamental truths in aviation... what goes up must come down... flying is the quickest way to drain your wallet... et cetera. What most people do not learn are the other fundamental truths: the ones that keep you safe. 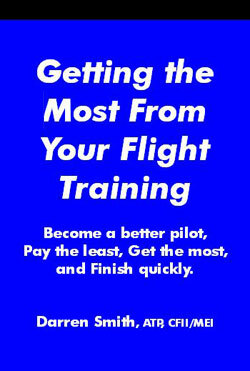 Aviation is a game of rules and if you want to survive, you must start with the basics and grow wiser. Through trial and error, most pilots figure these out sooner or later and one way or another. Lets start with sooner, and it’s much better to do it reading an article on safety rather than recovering from an unusual attitude. This is a follow-up to the article, Things Your Flight Instructor Wish You Knew(Helicopter). 1. Use the lights. Given the particularly dismal survival rate of mid-air collisions, why wouldn't pilots use as much lighting as possible when they are below 3,000 AGL or within 10 NM of an airport? The FAA did a study and found an 80% decreased risk of bird strikes when the landing light was used continuously during flight. Mike was flying along humming to his favorite music when ATC issued him a traffic alert. Neither airplane saw each other until they were within a mile of each other. Mike in his 172 and the pilot of the Lear had a better chance of seeing each other sooner by lighting up. 2. Practice your skills. From running through a VFR flight planning exercise to doing pattern work, you are one who benefits from every investment of study or CFI time you pursue. How are your landings? How are your autorotations? How are your approaches? When is the last time you practice your emergency procedures? 3. Avoiding silly things we should have thought of before. Play the "what if" game next time you day dream about your last flight. What would happen if there was an air bubble in the fuel line for one tank? Silly things like switching gas tanks after run-up have caused pilots to crash on the departure leg. Questions like that will help you to identify risks and manage against them. How many of those can you come up with for your aircraft. I'd like to hear your list. 4. Take care of your equipment. Sometimes the cost of a repair seems to outpace the risk associated with the problem. After the accident, you'll probably change your mind on the risk-cost analysis you performed. You put a tremendous amount of trust in the machine that defies gravity so it makes sense to give it the care and feeding that we fundamentally know it needs. Assist with annual inspections to learn the real capability of your aircraft. 5. Be smooth. In all your actions, smoothness will keep your flight safe and passenger friendly. Whatever you do, don't over react to a flight condition because you might cause the problem to get worse. Ernie was on final one day and felt himself getting too far behind the power curve which caused the sink rate to go up. He over reacted and reacted too late with the addition of power and ended up with tail strike. Remember your flight instructor's favourite phrase? "Small Corrections." 6. Know the winds when you land. One of the worst sins you might commit is to fail to see the windsock before you land so you know the runway conditions. It’s also useful to know other airport conditions which you can get from the Unicom or ATIS frequency. At an off-airport landing, use nature’s cues to determine the wind direction for your landing zone. Things like the glassy band on water, smoke, or flags give you a great idea of wind direction. 7. Understand Weather. Weather considerations cause a large number of general aviation accidents. From pre-flight planning to enroute weather checks using Flight Watch or monitoring enroute ATIS/AWOS/HIWAS broadcasts, learn and understand what the weather is doing, and avoid getting too close to weather you shouldn't be involved. with. Consider approaching your local community college to see if they have a meteorology course. 8. Follow the checklist. Checklists are one of the most important pieces of safety equipment on the aircraft. They ensure proper configuration of aircraft for flight operations. So why do people fail to use them? Don't allow yourself to forget to finish them, they don't take up too much time. Even if you have a simple aircraft, a checklist is a must. The NTSB database is full of accidents which include the phrase, "pilot's failure to follow the checklist...." When you're under stress, the checklist is a great tool to remind you of the right things to do. 9. Know where you are. Whether you are on a cross country or cleared for an ILS approach, pilots must be situationally aware at all times. This not only includes knowing where you are, but being aware of other aircraft in the vicinity. Improve your situational awareness by tuning in Unicom frequencies for enroute airports. What would happen if your GPS died? When was the last time you did a cross country with pilotage and ded reckoning? 10. Don't fly too close to the ground. This is an absolute sin because it’s a leading killer in that top three list of general aviation accidents. Whether you are buzzing or scud running, either can lead to premature impact. Aside from rules related to safe altitudes, do you have the skill to maneuver for extended amounts of time at low altitudes? 11. Fly proper traffic patterns. Use standard traffic pattern entry when approaching a landing zone while using due care to avoid the flow of fixed wing traffic. Know the particulars about airports you aren't familiar with. Things like traffic pattern altitude, right or left traffic are set up for a reason and available to all in the various directories good pilots use. Stay close to the airport when flying your pattern. It’s good for two reasons: 1) if your engine quits, you are likely to be set up to autorotate in the right place, and 2) you'll be visible to others who are approaching the airport because you are where they expect you to be instead of on a 4 mile final. Of course you are using all your lighting to that you are easy to see. In addition, your eyes are looking outside to find others who are near the airport. 12. Know what's good enough. A safe pilot has a passion for doing things correctly and goes beyond just following the rules. Is your life valuable enough to seek out the knowledge to excel or are you operating on the "just good enough" principle? Is your flying precise? Are you flying on-altitude, respecting minimums, and truly seeking out all available information for your proposed flight? It's not a matter of knowing what's good enough, it’s a matter of being satisfied you're prepare to execute a well thought out plan with any risk identified and managed. Unless something happens and the FAA becomes involved, you are the ultimate judge of your own performance. Be fair, but be critical. 13. Never give up. Experience grows a pilot's skill. Rough experiences grow a pilot's wisdom. Don't let the small things like a rough landing or minor scrape stop your progress. Use the experience to grow your wisdom and resolve to improve your skills with remedial training. See the associated article, Characteristics of Successful Pilots.